One of our experienced practitioners will arrive at your school half an hour before the workshop is due to start. 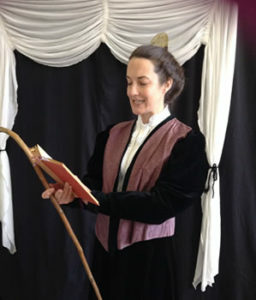 The facilitator will set up the POP-UP theatre in your school hall. We will require school benches for the pupils to sit on & chairs for the members of staff. Break time will be scheduled in, if time allows. During the workshop the pupils will meet a Victorian School Mistress, who will discuss Queen Victoria, Child Labour & Inventions. 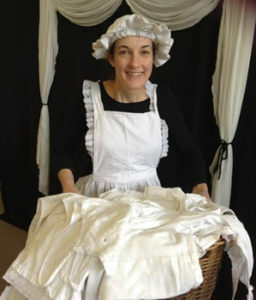 They also meet a parlour maid who chats about life as a domestic servant. The Pupils will be encouraged to participate in the workshop with acting and answering questions. The Resource notes give an overview of the history period and ideas for the classroom. Victoria was born in 1819 and had been brought up very quietly, but from 1830 she began to make public appearances and her coming-of-age, on her eighteenth birthday, was the occasion of some public rejoicing, and when she succeeded King William in 1837, she created a most favourable impression by the tact and composure which she displayed in difficult circumstances. Queen Victoria’s coronation took place the following year in 1838 and she remarked upon how proud she felt to be Queen of such a nation. Her full title was Queen of the United Kingdom of Great Britain and Ireland, Empress of India and the Colonies. Queen Victoria married her cousin Prince Albert of Saxe-Coburg in 1840, whose wide interests and counsel had an important effect upon the development of the queen’s character. She would turn to her husband for support and guidance on many an issue. Their first child, Victoria, was born later that year followed by Edward (Prince of Wales & Edward VII) the next year, and seven other children between 1843 and 1857. Queen Victoria reigned during a period of tremendous change both at home and abroad. Conditions for the poor in the industrial north of the country were growing worse, due to economic depression, and calls for political change were voiced by several parties. The industrialisation of Britain moved on apace and the Great Exhibition of 1851, conceived by Prince Albert, showcased over 100,000 industrial products by more than 13,000 exhibitors, over half of which were British, at the purpose built Crystal Palace in London. Britain’s Empire grew considerably during Victoria’s reign; at the height of its expansion the Union Flag flew over one quarter of the world’s land surface, taking in Australia, New Zealand, Canada, many colonies in Africa and the far east and the Indian sub-continent. Victoria came to be regarded as the figurehead for all of Britain’s possessions overseas. She played a considerable part in foreign policy, and on several occasions her personal intervention improved foreign relations. The death of her husband (who in 1857 had been created Prince Consort) from typhoid fever in 1861 changed the whole tenure of the queen’s life. Victoria was to wear the black of mourning for the rest of her days, and during many years of her widowhood she lived in almost complete seclusion. She had been the first sovereign to reside in Buckingham Palace, but after 1861 she was rarely in London and preferred Balmoral and Osborne to Windsor.